Obituary – Wilhelm, Vester A. 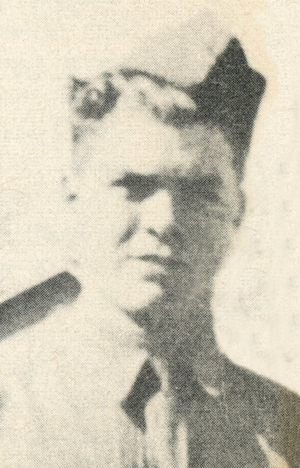 « Perry High School Alumni Association, Inc.
Obituary – Wilhelm, Vester A.
Corporal Vester Wilhelm, 22, serving in Battery C. 158th Field Artillery, died on January 4, 1941 at the Perry General hospital from wounds inflicted while he was home on New Year’s leave from Fort Sill. Military funeral services were held at 2:30 p.m. in the Perry High School Auditorium on Sunday, January 5, 1941. A crowd which more than filled the building attended the services which were in charge of Capt. Henry Morton, chaplain of the 158th Field Artillery, Fort Sill, assisted by Rev. James V. Gray, pastor of the First Baptist Church. A guard of honor composed of men from Battery C stood rigidly at attention at each end of the casket as the army chaplain read the service for the dead. The girls trio from Perry High School, where Wilhelm was a famous football player during his school days, sang “God Will Take Care of You.” The trio was composed of Margaret Plumer, Virginia Lee Magee and Lila Lee Davis, accompanied by Miss Rodolph. Burial was in Grace Hill cemetery. Leo Ricker, World War veteran, blew taps as the body of the Perry soldier was lowered to its last resting place, following the military burial service. Guard of honor at the funeral services was composed of Sergeants, Shea and Jirous, Privates F. Schomaker and Allen Wilson. Major H. R. Cress, former commander of Battery C., Merle McCormick, now commanding the battery, and Lt. Leroy Miller were in the detachment attending the funeral services from the army. Wilhelm, son of Mrs. Feba Wilhelm of Perry, came to Perry with his mother and brothers, James and Bennie Wilhelm, in 1925. He was an outstanding Perry High School athlete, having played with the Perry high school Maroon football squad in 1936 and 1937 as halfback. Survivors, other than his mother and two brothers, are a sister-in-law, Mrs. Kathryn Wilhelm of Perry; a step-sister, Pauline, and his father, Harry Wilhelm of Raydon, Oklahoma; five aunts, five uncles and other relatives.